Why? Why do so many of us, as educators, believe that learners can become great thinkers without the explicit teaching of thinking tools, strategies and example? When we want learners to develop as readers, writers, mathematicians or scientists, we explicitly teach the skills associated with those disciplines; we provide learners with appropriate strategies, tools, and of course, opportunity. When we want learners to develop as thinkers, we invite them to ‘go back to their desks and think about it’ or to ‘put on their thinking caps’. We hold unrealistic expectations that learners will develop their ability to think through invitation or opportunity alone. Experience has shown that this is clearly not the case. What if we could provide learners with the tools, and strategies associated with different learning jobs? What if our learners could know and understand the relationship between learning jobs and the thinking tools and strategies that could be deliberately used to enhance that learning? What if our learners could plan and evaluate their own thinking, direct their thinking, extend their thinking? This is the purpose and power of thinkbox/thinktower™. what are thinkbox™ and thinktower? The thinkbox™ and thinktower™, thinking frameworks, identify thinking tools, and strategies in accordance to ‘learning and thinking jobs’. In order for learners to be ‘great learners’ they must also be ‘great thinkers’. Learners will learn how to identify their learning job and then the thinking that is required to do that learning effectively. They will then self select the right tool, at the right time, as they progress through their learning experiences. In addition to using thinkbox™ and thinktower™to plan their thinking tools and strategies, learners will also use the framework upon the conclusion of their learning journey to ‘track’ the thinking tools and strategies that they actually used. Metacognition is promoted as learners evaluate their tool use and set goals for improvement next time. 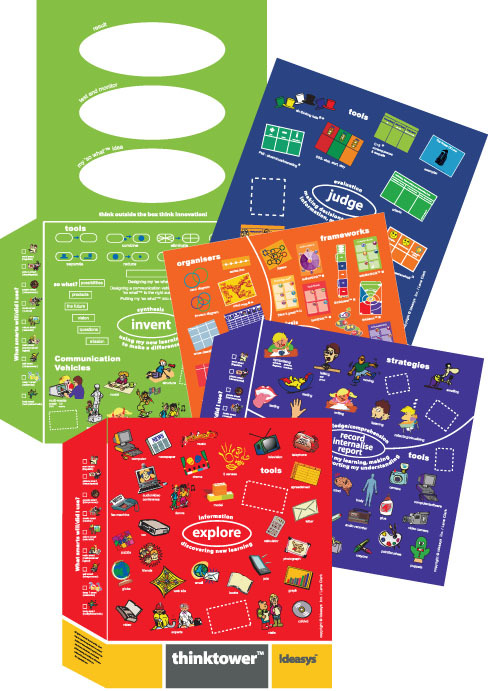 By design, the nature of the thinkbox™ best suits thinkers with strong linguistic preferences; while the thinktower™, although consistent in purpose and method of use to the thinkbox™, has been designed with visual or pre reading learners in mind. Teachers demonstrate and use both models in order to meet individual learner preferences. Developmentally, the frameworks are first used by the teacher, then collaboratively by both teacher and learners and ultimately, the learners use the framework independently, as they take control of their learning. Use of these frameworks ensures that thinking skills, tools and frameworks are explicit to the learner throughout the thinking and learning experiences. In turn, greater ownership of the thinking processes will evolve and learners will come to learn how to think for themselves.